Tues., Mar. 19th, Celebrate Women's History Month. Get to Know the WASP! 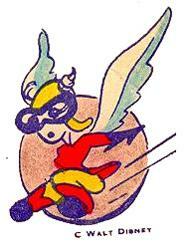 Note who designed the WASP insignia. 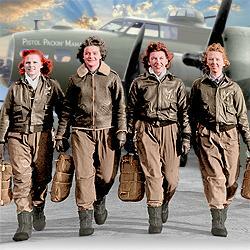 (L to R) Frances Green, Margaret (Peg) Kirchner, Ann Waldner and Blanche Osborn leave their B-17, the Pistol Packin' Mama. No sting--but this month's program packed a wallop worthy of a WASP. A large audience heard the fascinating story of the Women's Airforce Service Pilots (WASP) and the vital role it played in World War II at St. Mary's Episcopal Church in Lakewood on Tuesday, March 19th. The groundbreaking aviators of WASP proved their worth in the exclusively male--not to say aggressively macho--world of the US Army Air Force of the 1940s. The courage, skill and decisiveness shown in the cockpit of the brand-new B-17 Flying Fortress by these patriotic women made believers out of the most skeptical. WASP paved the way for all current active duty-female pilots and crew members--like those now flying out of Joint Base Lewis McChord, a number of whom were present to share their experiences and exploits as well. The program, like most Lakewood Historical Society programs, was FREE and open to the public. Refreshments were served, courtesy of the Federally Employed Women, Rainier Chapter. For information about future programs, check this "Programs" page early every month, or call Becky at (253) 370-6676.